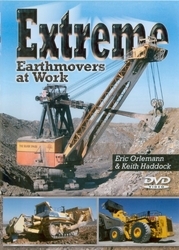 Author Keith Haddock and videographer Eric Orlemann present examples of many of the major types of excavating machinery used in strip and open-pit mining. Star of the show is the Bucyrus-Erie 1950B stripping shovel Silver Spade. Other performers include the Komatsu D575A-2 Super Ripper and D575A-3 Super Dozer crawler tractors; LeTourneau L1850 and L2350 wheel loaders; Cat 994F wheel loaders, 657E motor scrapers and D11R crawler tractors; and Liebherr R995 hydraulic shovels. Playing time approximately 80 minutes.